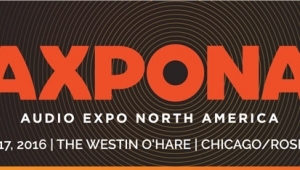 AXPONA Chicago 2016 was, by all accounts, a success. JD Events, who stage the show, report that they sold 5934 tickets, a 16% increase over 2015. Correspondingly, 2015's unique-visitor count of 3626 increased by over 400 to 4,092. 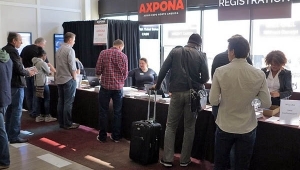 On Sunday, the show's experimental Student Day program, which offered a $5 rate for most college students and free admission for students from two partner colleges, drew 137 attendees. This, it should be added, was on a rare day with high temperatures and skies perfect for sunning on the shores of Lake Michigan. Given a choice between the reportedly popular all-female band Catfight (axpona.com/pressrelease_article.asp?id=1492), who performed for students, or sunning in shorts, it's not surprising how many opted for latter. What is not known is if significantly more students would have attended on a cool and cloudy day. 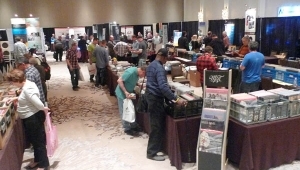 Given how busy we were blogging rooms, neither Herb Reichert nor I paused to snap pictures of entertainment or seminars. Word has it there was some really good stuff, but I'm afraid we missed it. Suffice it to say that this was a complete show, with something for everyone (everyone, that is, except hungry members of the industry and press who discovered, at both the opening reception and the press briefing on Friday morning, that vegetables are somehow considered extraneous to a healthy diet; Paragon Sight & Sound did a much better job on that score at their Friday evening press event). I'm afraid Herb and I also missed some rooms. 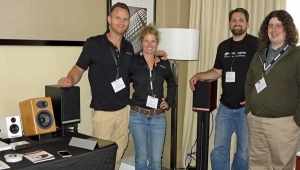 There were 111 active exhibits, and a bunch more among the 111 booths and tables in the Marketplace and Ear Gear Expo. I managed to cover 60 of them, but I'm afraid our combined total fell short. Exhibitors whom we missed, and who will be in Munich, are invited to contact me so I can do my best to cover them then. 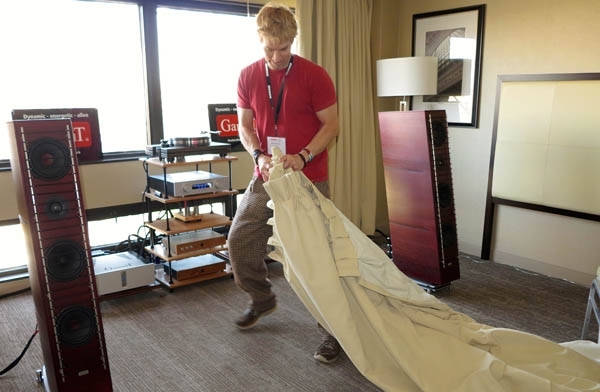 So what does this have to do with the closing photo above, which shows distributor Michael Vamos of Audio Skies dragging extremely heavy curtains through his GamuT room? 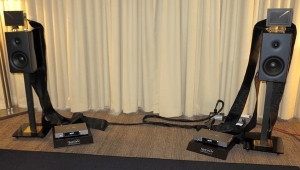 Because it illustrates the lengths to which some exhibitors went for good sound in their rooms. 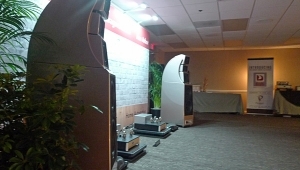 Vamos discovered that both the curtains and absorbent walls were impacting bass reproduction. Not everyone shared his experienceI questioned a few other exhibitors about thisbut in Michael's case, what mattered is what he heard. So the curtains came down. Literally. Because Michael was busy re-hanging the curtains, he hadn't yet broken down his system when I entered his room at about 4:15. 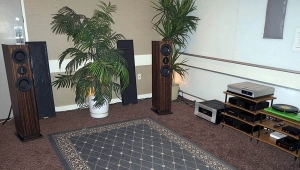 Therefore I can report that the GamuT RS7 loudspeakers ($39,000/pair), connected to a full array of GamuT electronics and cabling and a Pear Audio Blue Kid Thomas/Cornet 2 table/tonearm combination with external power supply ($9990), produced great, deep, but slightly boxed-in bass. 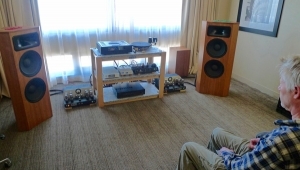 (I suspect the speakers could benefit from bigger quarters.) Was the slam impressive? You betcha. All that exposed glass on those completely exposed windows no doubt contributed to the slightly metallic veneer I heard on top. But that was the case in lots of rooms. All in all, the sound was stellar. This was, after all, a hotel, in which people had very limited time to set up and dial-in very complex systems. Some succeeded, a few stumbled badly, and most did the best they could with a compromised situation. Herb and I both had our favorites among the exhibits. 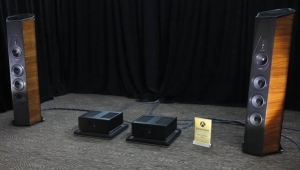 To quote Herb: "At Axpona 2016, the average room-to-room sound quality was higher than any previous show I have attended. I visited about 45 rooms and more than half of them played music in an exciting, enjoyable, or seductive way. 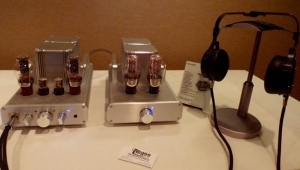 My jump-from-the-deck favorites (in no particular order) would be: MSB Technology, Paragon Sight & Sound, Bricasti Design, Border Patrol Audio/Volti Audio, Abyss/Woo Audio, Audio Union, Mr Speakers, High Water Sound, Peachtree, and Joseph Audio. 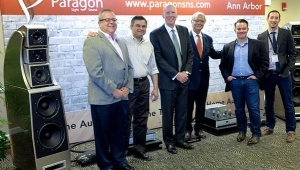 The best of the best, would have to be the Paragon, MSB, and Woo Audio rooms." Of the few rooms both Herb and I visited, the two favorites of his which are also a Best of Show for me are the Paragon Sight & Sound room with Wilson/et al (see below) and the High Water Sound room with Jeffrey Catalano's unique mix. 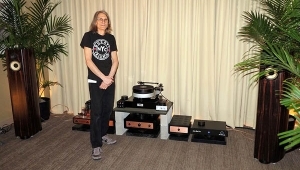 Vinnie Rossi/Harbeth/Acoustic Signature/Tellurium Q and Hanson AV's Magico/Devialet/Aurender/Iconoclast room were also right up there. 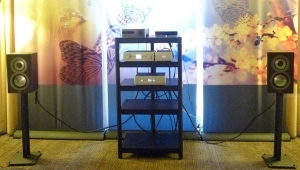 For the high-priced spread, in addition to Paragon's Wilson Audio/dCS/Doshi/Transparent/HRS set-up, my votes go to The Voice That Is with Tidal/Bricasti/Aurender/Purist/Stillpoints and more, and the Musical Surroundings/Quintessence Audio room with Sonus Faber/AMG/DS Audio/Aesthetix. Budget and lower-priced standouts included April Music/Aura Note, Spatial/Red Dragon/Lampizator/AntiCables, and Salk/Wells/Lampizator/Danacables. I'm sure I've left someone out, but it's 1:10 AM, and the dogs are preparing to picket our house if I don't get to bed. 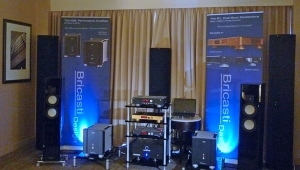 Next shows: Munich High End May 5-8 and THE Show Newport Beach (Irvine) the first weekend of June. I hope to see you there.